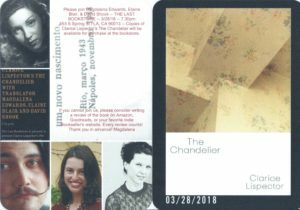 Brazilian writer Clarice Lispector’s second novel THE CHANDELIER (O Lustre), never before translated into English, is here! Published on March 27th, 2018, by New Directions. You can order a copy at IndieBound here or Barnes & Noble here or Amazon here. Find me on Goodreads here. You can read about “My Years with Clarice” in my blog here. THE CHANDELIER / O LUSTRE on Twitter is here. You may email me regarding events and other The Chandelier-related queries at magda8 at gmail dot com. NYC — March 27th, 2018, at 7.30pm — Brooklyn Public Library with Idra Novey, Porochista Khakpour, and John Freeman, moderated by Elliot Holt. Details & RSVP here. 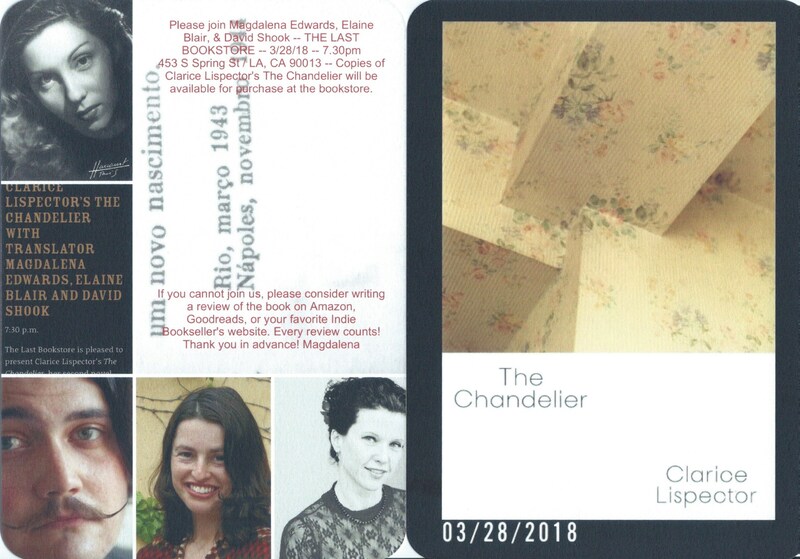 LA — March 28th, 2018, at 7:30pm — The Last Bookstore with Magdalena Edwards, Elaine Blair, and David Shook. Details & RSVP here. More news about book events soon! New York Times — Review by Parul Sehgal. New York Times — Review by Martin Riker.